It seemed fitting that Melbourne’s few days of warm sun had changed to a cool and rainy night before Mark Lanegan was due to take the stage at the Croxton Bandroom, fans in the queue waiting to get in all wrapped in their dark winter coats. Warming the crowd from the blistering winds outside, local band Roller One took to the stage, playing the perfect set to prepare the crowd. Supporting their new album BETTER THAN FINE, Roller One’s deep folk and alt country was a perfect choice for support for Lanegan’s often-harsher sound. Definitely a local act worth catching if you have the opportunity to do so. The room was packed, everyone waiting for Lanegan to arrive, a sense of heavy anticipation filling the room. Lanegan is here in support of his tenth solo studio album Gargoyle, released in 2017, but as Lanegan is such a prolific artist (Gargoyle was his fourth album in five years at the time of release) the crowd can never be certain exactly what songs from his extensive catalogue he’s going to play, everyone hoping he’ll play their own personal favourite. The lights dimmed impossibly lower, the stage almost as dark as the rest of the room as Lanegan took to it, supported by musicians Shelley Brien and Jeff Fielder, and immediately jumped into my personal favourite When Your Number Isn’t Up, Lanegan’s deep and somber baritone filling the room, audience swaying and moving to it. 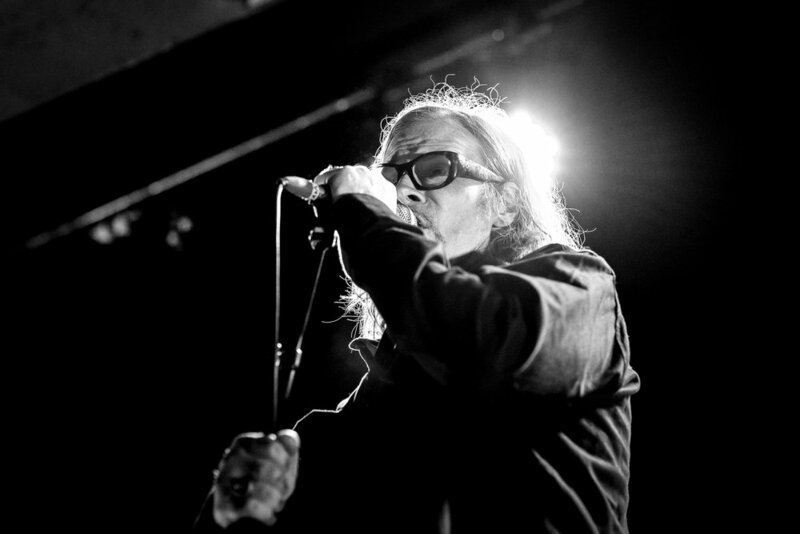 As an artist Mark Lanegan is not one to stop and pause to talk more than a few words and jumps into the next song with barely a break. No one would complain though, as it means he plays as many songs as he can in his allotted time. Playing an almost two hour set, highlights included Shelley Brien joining him to sing the melancholic love duet of Come To Me, new song Beehive off of Gargoyle that has a surprisingly upbeat tempo and crowd favourites Hit The City, You Only Live Twice, Morning Glory Wine and Phantasmagoria Blues. Lanegan may be here to support Gargoyle, but played a majority of songs from his album Bubblegum, released in 2004 and very much still a fan favourite amongst his works. Lanegan barely left the stage before encore, playing four more songs to an enraptured audience that had been left almost too stunned to cheer after the main set, Lanegan asking “What does it take to get some cheers around here?” as he rejoined us, the audience clapping and hollering in response. Seemingly pleased with our cheer this time, he launched into Torn Red Heart from album Phantom Radio, before following it with Bombed and Wildflowers; the latter a deep cut from Lanegan’s first solo album The Winding Sheet. Its says a lot about how dedicated Lanegan’s fans are that the majority of people were singing quietly along with him. Shelley Brien left the stage then to much applause, leaving the stage to just Lanegan and Jeff Fielder as they closed the night with a blistering rendition of Screaming Tree song Halo of Ashes, Fielder playing a screaming guitar solo halfway through, demonstrating just how good of a musician he is. And with that, Mark Lanegan left the stage with a murmured thank you, leaving us after all most two hours. 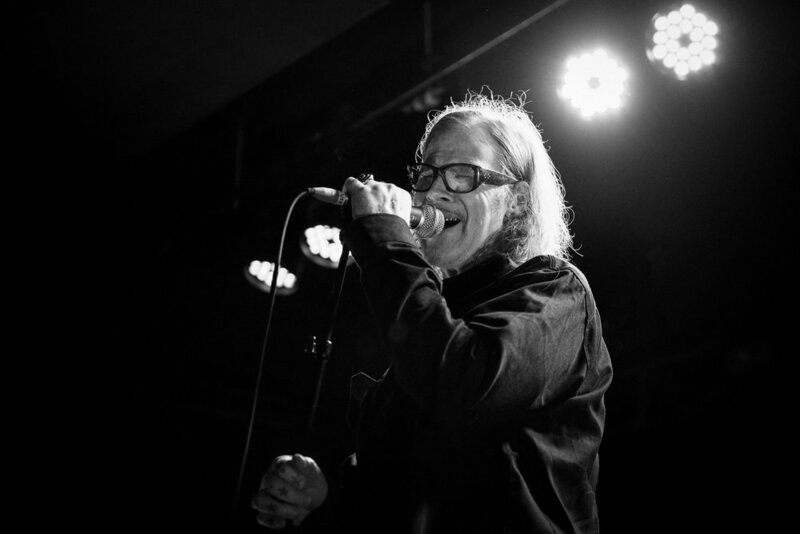 Watching the large queue that was forming, snaking through the room as fans waited to meet him at the merchandise table, it was clear that Mark Lanegan has a very large and dedicated fan base here in Melbourne that will always welcome his return with open arms and ready ears.